I could sure use these this week! My sinuses/ allergies are making me CRAZY, along with the weather-- it's pouring non-stop here. Plus, I can't drink enough coffee or water while I type away! 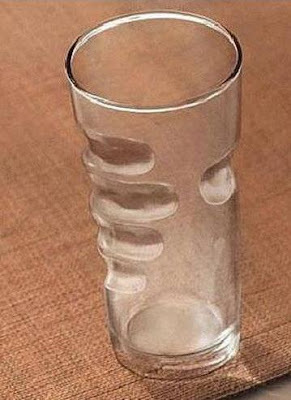 I love the glass with the finger imprints! 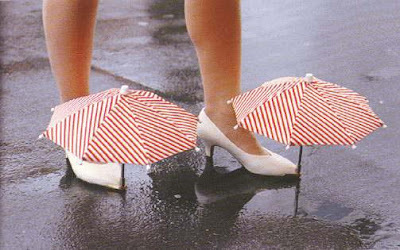 But would totally buy the shoe umbrellas if they really worked! Happy WW! Hilarious!!! I love that the woman with the shoe umbrella honestly thinks she's keeping them from getting wet!! Does the cup come in different sizes or is one hand fits all? There have been moments when having tissue at the ready like that would have been most welcome! All it needs is a trash can for the used ones! I'm not feeling too great myself today! Ugh. I like the little umbrellas for the shoes. Happy W.W. I saw the first one on Jay Leno once!! But my favourite are the shoe umbrellas! I mean, honestly: if we are walking on the street with a Manolo (well, we can dream) and it starts raining, those umbrellas would sure be useful! I, too, agree with blueviolet but I will take a compost bin. The show umbrellas are just silly! Though, so is the T.P. on your head. It, at least, is a good concept! The toilet paper one made me laugh out loud because it is so true! Where did you get these? Do they make that toilet paper thing for kids? I'd buy two right away!! Hahaha! There are two books dedicated to these inventions and they never get old. I laugh everytime. I have bad allergies today the TP on my head could come in handy...hmm. It's raining non-stop here in upstate NY too. In a way I like it, nothing else to do but sit and write. Something about melancholy weather gets the gears turning. My hubby could really use the toilet paper one! lol. I need that first one, too. My allergies are horrible as well :). LOVE the shoe umbrella! I've always thought there needs to be such an invention. 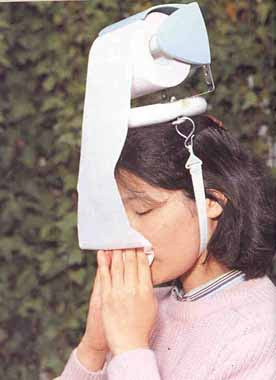 I want that head tissue thingy...this has been an awful week for my eyes, nose, and throat. Lordy. That would have been so helpful. Our weather is going crazy. Rain, sun, thunder boomers, hot, cold. 80 degrees today, 65 tomorrow. Global Warming, anyone? omg you always have the BEST PICTURES!! where do you get these things?! Ohmygod, that hat was made for me! I not only have what Mr. J likes to refer to as Freak Eye (my allergies make my right eye water suddenly and without warning), but I have to blow my nose at the most inopportune times. LOL...I hear ya about the allergies. Me and my oldest are miserable, but she wins(or does she) since her eyes are just tearing up constantly. Poor thing. I love the umbrella shoes! hahaha. Those shoe umbrellas are awesome! WANT! Hey, me too! Lots of rain, lots of sinus problems. I hope you feel better soon!